What is the Theory of Liquidity Preference? Under the Theory of Liquidity Preference, an investor faced with two assets offering the same rate of returnRate of ReturnThe Rate of Return (ROR) is the gain or loss of an investment over a period of time copmared to the initial cost of the investment expressed as a percentage. This guide teaches the most common formulas for calculating different types of rates of returns including total return, annualized return, ROI, ROA, ROE, IRR will always choose the more liquid asset. The term liquidity preference was introduced by English economist John Maynard Keynes in his 1936 book, “The General Theory of Employment, Interest, and Money.” Keynes called the aggregate demand for money in the economy liquidity preference. According to Keynes General Theory, the short-term interest rate is determined by the supply and demand for money. Holding money is the opportunity costOpportunity CostOpportunity cost is one of the key concepts in the study of economics and is prevalent throughout various decision-making processes. Opportunity is the of not investing that money in short-term bonds. The demand for money is a function of the short-term interest rate and is known as the liquidity preference function. Money supply is usually a fixed quantity set by a central banking authorityFederal Reserve (the Fed)The Federal Reserve, more commonly referred to The Fed, is the central bank of the United States of America and is hence the supreme financial authority behind the world’s largest free market economy.. L(r,Y) is a liquidity preference function if and if , where r is the short-term interest rate and Y is the level of output in the economy. 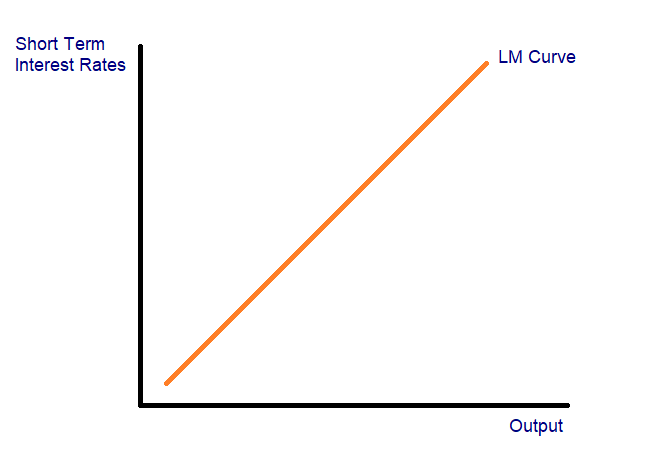 Formally, the liquidity money (LM) curve is the locus of points in Output – Interest Rate space such that the money market is in equilibrium. Alternatively, we can say that the LM curve maps changes in money demand or supply to changes in the short-term interest rateInterest RateAn interest rate refers to the amount charged by a lender to a borrower for any form of debt given, generally expressed as a percentage of the principal. The asset borrowed can be in the form of cash, large assets such as vehicle or building, or just consumer goods.. 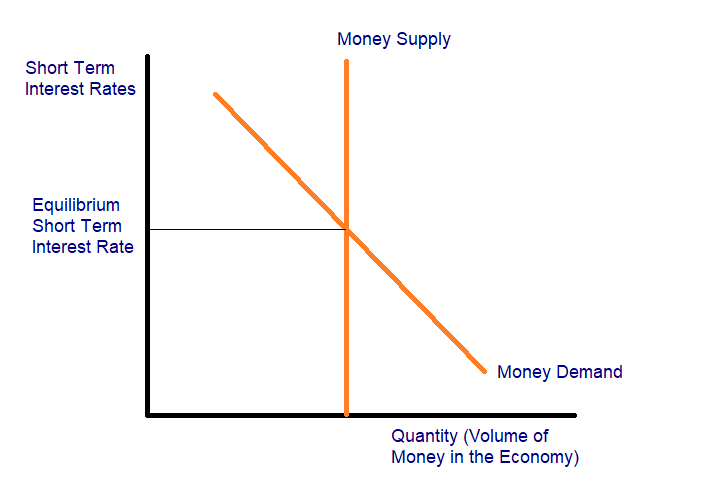 According to the Theory of Liquidity Preference, the short-term interest rate in an economy is determined by the supply and demandSupply and DemandThe laws of supply and demand are microeconomic concepts that state that in efficient markets, the quantity supplied of a good and quantity demanded of that for the most liquid asset in the economy – money. The concept, when extended to the bond market, gives a clear explanation for the upward sloping yield curve. Since investors strictly prefer liquidity, in order to persuade investors to buy long-term bonds over short-term bonds, the return offered by long-term bonds must be greater than the return offered by short-term bonds. Formally, if U(Asset A) > U(Asset B), and L(Asset A) > L(Asset B), then rA > rB. The difference in interest rates is known as the liquidity premium or the term premium. A commonly used measure of the term premium is the 10-2 spread. The Theory of Liquidity Preference is a special case of the Preferred Habitat Theory in which the preferred habitat is the short end of the term structure. The Preferred Habitat Theory states that the market for bonds is ‘segmented’ on the basis of the bonds’ term structure, and these “segmented” markets are linked on the basis of the preferences of bond market investors.